The Scottie Brand First appeared on Sharpes of Aberdeen’s split cane rods in the 1930’s and became a a firm favourite for single handed handed trout rods and double handed salmon rods. 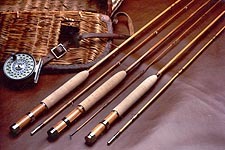 A Scottie split cane rods have remained in production since then until 2010 when S & J Tackle. who had taken on the business ceased trading. By the time production finished the perky little Scottie could be seen not just on the rods but also a range of fly tying vices and accessories. The Scottie vice has become a firm favourite with all who use it, the lever action provides a sure grip on any size of hook and offers the professional fly dresser and robust and easy to use workhorse for their tying bench. In 2014 PWW Designs took over the business and tooling and relocated production to Huntingdon. In early 2015 a limited number of carbon fibre rods were manufactured and by 2016 there will be a range of Scottie rods available including the re-introduction of the split cane single handed river rods. In order to restart rod production in the UK it has been necessary for essential components to manufactured or sourced from a UK supplier, with production of so many of the leading brands being moved to the Far East this has been a challenge, but luckily there are still UK craftsman able to supply some of these and PWW designs have set manufacture of components such as reel seats using the original tooling.